The July issue of Official Xbox Magazine in the USA seems to have revealed a new feature that none of the other magazines have picked up on so far. The following quote from the magazine describes when Niko approached a car fom behind a prompt appeared on screen saying "Press LB to open boot", (that's 'trunk' for you Americans), the LB button on th Xbox controller is equivalent to the L1 button on PlayStation controllers. "We also noted how, when Niko approached a parked sedan from behind in preparation to carjack it, an interface prompt approached in the upper-left corner of the screen: "Press LB to open boot." Boot, of course, is the British term for "trunk," leading us to wonder just what we might be able to stash in the backs of our cars-weapons, bombs, kidnapped people? Or even more interestingly, what we might discover in other people's boo-er trunks? For the moment Rockstar isn't saying." Nothing more was said on it, as clearly Rockstar don't want to discuss this right now. It isn't clear whether we'll only be able to use the boot of a car at certain points in the game or on certain missions, or whether we'll be able to make use of it whenever we wish to. Let us know what you think in our forums. UK publication Playstation 3 Unlimited has a new 6 page preview of GTA IV. There are a few new minor details provided by the magazine in its June issue. You'll be able to use the right analogue stick on the Xbox 360 (and presumably PS3) controller to look around. GTA IV Screenshots and Previews Galore! *UPDATE*: I have uploaded the unwatermarked versions of the screenshots, which hopefully you'll find are a little nicer to look at. *UPDATE 2*: Added some very high resolution official artwork and better quality screenshots. Several gaming websites have all published previews of GTA IV today, all of them including some brand new screenshots, in addition to digital versions of all the screens we've seen in print over the past couple of months. There doesn't appear to be anything new said in the previews, but links to the various articles are after the screenshots below. Rockstar have just announced through a press release that a "special edition" of Grand Theft Auto IV will be made available for both the Xbox 360 and PlayStation 3 versions. The special edition includes a little more than you normally get with "special edition" versions of popular games, details below from the press release. This special edition will set you back .99 (RRP) in the USA, prices for other regions have not yet been confirmed. Issue #153 of PLAY, the UK publication we reported on last month because of a printing error with the IV logo is now out. The 5 page preview provides a couple of interesting tidbits, in what is otherwise full of information we already know about. Niko's mobile phone has the ability to receive text messages and also has a camera which you can take pictures with. Thanks to MattyBlog for the scans. Niko will have access to a wardrobe in his flat - it is not clear whether this will be on the scale of what we had in San Andreas, or more like what we saw in Liberty and Vice City Stories. Rockstar are thinking about doing something that the True Crime games, by giving every street it's own name which will fade in/out of the screen when entered, rather like each area did in previous GTA games. This has not yet been finalised though. Rockstar are also trying to remove some of the less realistic things from GTA, such as arrow and markers showing the player where to go. Instead we will possibly make use of gadgets in Niko's possession such as his mobile phone. Thanks to GTA-Xtreme.de for the news. Apart from a number of magazine scans and screen captures from the first official trailer, we haven't seen any proper screenshots of Grand Theft Auto IV yet. However, an article published recently by the NYTimes which discusses the exclusion of the Staten Island borough appears to have included with it the first digital screenshot we've seen of the game. The image (below), which has been printed in a couple of magazines already, seems to have been resized from it's (presumably) original HD version, nevertheless, it's still nice to see something nice and shiny. Let's hope we get some nice high definition screens soon. Official PlayStation Magazine Australia is yet another magazine with a GTAIV preview this month. As with the Italian one yesterday, there isn't much new to report on other than the few details below. During the demo that OPM saw, Niko walked past an ATM machine and a message appeared on the screen waiting for a button press in order to access funds. While nothing more is said about this, it does imply that we'll be able to deposit and withdraw money, and that itself suggests that we'll be needing to use money more wisely than in previous GTA games. Driving physics have been "tirelessly tweaked and enhanced". When a car drives past with loud music you'll be able to hear and feel the bass. You won't be able to play through a 'single player' game with a friend (co-operative), however, there will be a co-op mode implemented, along with other multiplayer modes which we still have no info on. Rockstar are focusing their attention on this game for now, and there are currently no plans for San Andreas Stories (or another GTA game) for the PSP. 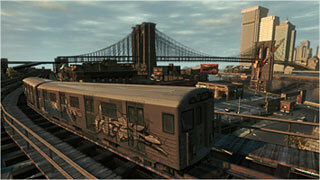 Further, it is not known whether GTAIV will pave the way for more sequels. Although Dan Houser has said he "would have a certain confidence" setting GTA outside of the USA, which certainly opens up the possibilities for future GTA games. Thanks to Wehmer for the info. Italy's version of Official PlayStation magazine have a preview of GTA IV this month, they also seem to have received the same demo as the other mags we've reported on so far. There isn't much new to say on this one if you read the new tidbits from OXM we posted about today. However, there are a few additional details to mention which clarify some of the things in said OXM article. Further to the new targeting system, it appears Niko is able to strafe left and right when locked on to a target after pulling out a weapon to avoid being shot. Emphasising the detailing gone into the city, you can see what's under grates on the sidewalk providing there's enough light shining into it. While hi-jacking cars driving along the road is a familiar task for GTA players, hi-jacking a parked vehicle seems like it has more to it now. No longer can you simply open the door and drive off. Now you'll have to be stealthy about it, break the window to get in, and then hot wire it. These details may be a little sketchy due to mistranslation, as obviously the magazine is in Italian so keep checking back for any further clarification we get on the aforementioned details. Also in the magazine is some new artwork, depicting a man laying on a sofa smoking an unknown substance. Thanks to GTA-Series for the scans and translation. The latest issue of the UK publication Official Xbox Magazine is carrying a preview of Grand Theft Auto IV. They seem to have received the same demo that was given to the likes of OPM and GameInformer, however there are some new details revealed. Rockstar are progressing well with the game, which is now over two-thirds of the way to completion. It is implied that the ability to manually aim guns such as a pistol has now been implemented, when Niko pulls out a pistol, the camera will zoom in slightly, and a crosshair fixed to the centre of the screen appears. OXM confirm that the much loved sexual innuendo famed in the GTA series will of course be seen throughout GTA IV. Niko is able to climb and descend fire escapes, telegraph poles and the like. He'll also be able to enter skyscrapers (and throw people off them). Central Park will have its own recreation in the game, it is not yet known what its name will be. Boats are confirmed and their handling is said to be improved. One of the advantages of recreating New York is that the guys developing the game at R* North can simply call the in-house researchers at R* NYC and ask them about specific things which they have far more knowledge about. Thanks to Loose Head for the scans. A number of large gaming websites have been reporting on an interesting quote from Dan Houser, creative Vice President of Rockstar Games, in the latest issue of Official PlayStation magazine. The question posed to Dan regards the limitations of the Xbox 360, with it only being capable of playing games on DVD format, and the fact the "Core" system lacks a hard drive - 6GB of an Xbox 360 hard drive is reserved for system use and game features, such as in-game caching to speed up load times. Dan not only confirmed that the Xbox 360 does limit what they can do with the game, but also suggested that the PS3 also has a few limitations of its own. On PS3 you've got a guarantee that every machine is going to have a hard drive and, with Blu-ray, you've got plenty of storage, whereas on Xbox 360 there's no guarantee of a hard drive and you're working with the DVD format. Does that create limitations? "Yep. To be honest with you we haven't solved all those riddles yet. Both of them have enormous challenges. Again, that's been an advantage having the guys at San Diego who are freakishly clever and full-time dedicated to us, but we're not there with either yet. There are problems on both. We'll get there with both, but both have their own particular pleasures and pains." You can definitely count on Rockstar doing a great job with the game for both platforms, but which version, if any, will end up being a "better" buy? This question is probably only relevant if either you own both consoles, or if you don't own any and are still deciding which one to buy. The Xbox 360 seems to have greater limitations without it having a guaranteed hard drive, and the fact it uses standard DVD's, but then again, it also has exclusive content confirmed for it, while the PS3 version doesn't. It's not clear what the specific limitations are for the PS3 version, but hopefully whatever they are they will be sorted out before October, the same goes for the 360 version. We'll update you when we get further information on the differences between both versions of the game.